Pamphlet. 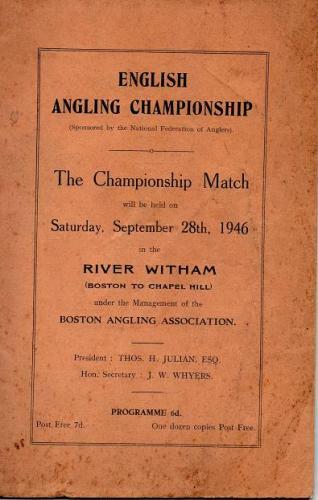 This match took place on the river Witham under the management of the Boston AA. Originally costing 6d this must have been quite an event just after the end of the war. With entrants from all over the country and adverts throughout, this is a real piece of social and piscatorial history. Soiled and well-thumbed it is complete and tight.